The initiate search command can be used to vary the style of operation. If the tracker is frequently commanded to resume search, it operates more like a star "mapper" than a "tracker." If it is commanded only infrequently, it operates more like a "tracker." A bright object sensor and shutter mechanism protect the image dissector from excess energy from the Sun, the Moon, or the lit Earth. 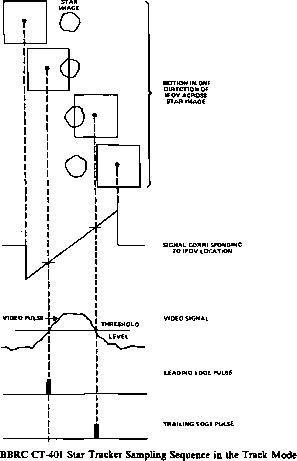 The sensor will close the tracker's shutter when a bright object approaches the FOV. This occurs for the CT-401 when the Sun lies within 42 deg of the FOV optical axis. Additional output signals from the tracker include indication for search or track mode, a bright-object sensor ON or OFF, a high-voltage monitor, and a temperature monitor. The temperature monitor can be used to correct the star position coordinates for temperature effects, as described in Section 7.6. Additional details concerning the CT-401 tracker are given by Cleavinger and Mayer  and Gottlieb, et al., . A gyroscope, or gyro, is any instrument which uses a rapidly spinning mass to sense and respond to changes in the inertial orientation of its spin axis. Three basic types of gyroscopes are used on spacecraft: rate gyros (RGs) and rate-integrating gyros (RIGs) are attitude sensors used to measure changes in the spacecraft orientation; control moment gyros (CMGs) are used to generate control torques to change and maintain the spacecraft's orientation. Rate gyros measure spacecraft angular rates and are frequently part of a feedback system for either spin rate control or attitude stabilization. The angular rate outputs from RGs may also be integrated by an onboard computer to provide an estimate of spacecraft attitude displacement from some initial reference. 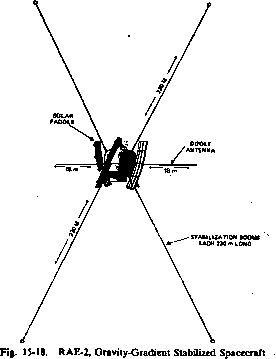 Rateintegrating gyros measure spacecraft angular displacements directly. In some applications, the RIG output consists of the total spacecraft rotation from an inertia! reference. In other cases, output consists of the amount of incremental rotation during small time intervals. An accurate measure of the total attitude displacement may then be obtained by integrating the average angular rates constructed from the incremental displacements. Average angular rates constructed in this manner may also be used for spin rate control or stabilization via a feedback system. RIGs are generally more accurate than RGs when used for either of these procedures. They are usually much more expensive, however. Control moment gyros are not attitude sensors like RGs or RIGs, but are used to generate attitude control torques in response to onboard or ground command. They operate much like reaction wheels (Section 6.6) except that their spin axis is gimbaled. Torques are generated by commanding a gimbal rotation and thereby changing the spin axis orientation. CMGs may be used in conjunction with RGs or RIGs and an onboard computer as components of an attitude determination and control system. Because of their expense and weight, CMGs are used only on large spacecraft. 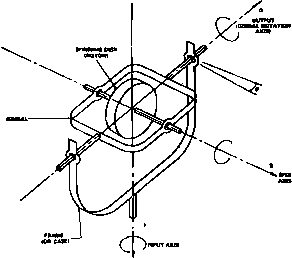 All gyros have the basic construction geometry shown in Fig. 6-45. The angular momentum vector of an RG or an RIG is fixed in magnitude and parallel to the gyro's spin axis. Because this vector maintains its inertial orientation in the absence of applied torques, spacecraft motion about the gyro's input axis causes the gimbal supporting the spin axis to precess about the output axis, or gimbal rotation axis. The output of an RG or an RIG is obtained from the motion of the gimbal. A CMG operates essentially in the reverse manner. A commanded displacement of the gimbal and the resultant change in the angular momentum vector causes a control torque about the gyro's input axis. as an Inertia/ Reference Assembly, or IRA, is used for HEAO-1 attitude determination and spin rate control. The input axes of these gyros are oriented so that any combination of three gyros will provide complete three-axis information. The extra gyro is included for redundancy. The IRA proposed for SMM will consist of three TDOF RIGs. 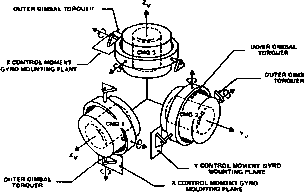 A configuration of three TDOF CMGs, shown in Fig. 6-46, was used in the Skylab attitude control system. \ a' ' Inertia! V at /Gyro where w/( w0, and ws are angular velocity components along the gyro's input, output, and spin axes, respectively, and I is a unit vector in the direction of the gyro's input axis. The output of an RG is thus proportional to the spacecraft angular rate about the input axis. Rate gyros are the simplest and the least expensive gyros. Their accuracy is generally suitable for spin rate control in a feedback system, but their integrated output requires frequent correction for precise attitude determination using other sensors such as Sun sensors or star trackers (Section 21.3). Errors in RG output are generally caused by nonlinearity, drift, and hysteresis. In addition, input accelerations may affect their accuracy if the gimbal is not perfectly balanced. An improvement over the conventional rate gyro is the closed-loop rate gyro, in which an electromagnetic torque rebalance system reduces gimbal angular excursions by about three orders of magnitude. The gyro output is then derived from the current required to maintain the gimbal at the null (i.e., zero deflection) position. The restricted gimbal deflection improves linearity and reduces drift rate instability. Some characteristics of representative closed-loop rate gyros manufactured by the Bendix Corporation are listed in Table 6-8. Descriptions of several other types of rate gyros are given by Schimdtbauer, et al., . Additional details concerning the operation of rate-gyros are given by Greensite  and Thomson .